Williams admissions work the same as admissions at most other elite colleges. If you understand the process at Swarthmore or Princeton, then you understand 99% of what happens at Williams. There are a variety of books about admissions at elite colleges, e.g., The Gatekeepers and A is for Admission. They capture 90% of the details. (These books are somewhat dated and may guild the lily a bit when it comes to race.) Williams Magazine published (pdf) an excellent 2005 article, “Recipe for Success,” about admissions. Virtually everything in it is true, but it also leaves out many of the more controversial aspects. The purpose of this post is to explain how the Williams admissions process works in reality, not how it should work. After evaluating the applicant’s SAT scores, high school grades, essays, class rank, high school academic program, support from the high school administration, AP test score — or IB test scores — and teacher recommendations, admissions readers assign the applicant an academic rating from the scale 1 — 9, with 1 being the best. These ratings are high-school-quality adjusted. At an elite school like Boston Latin or Exeter, you can be in the top 5% or even lower and still be an AR 1. At a weaker high school, you need to be the valedictorian. At the weakest high schools (bottom 25%? ), even the valedictorian is almost never considered smart enough to go to Williams, at least in the absence of top standardized test scores. Williams, and all other elite schools, use this system because academic rating does a wonderful job of predicting academic performance at Williams and elsewhere. Academic rating is, precisely, a “single linear scale” and it is, by far, the major driver of admissions decisions. This is true both for the process as a whole and within sub-groups. For example, African-American applicants with academic rating 1 to 3 are virtually certain to be admitted while those with academic rating 8 or 9 are almost always rejected. The College may have different standards across sub-categories but, within each subcategory (except athletes and development prospects), the academic rating explains 90% of the variation. Second, students with an academic rating worse than 2 (i.e., 3 or higher) are summarily rejected unless they have a specific “hook” or attribute. The readers also assign any of more than 30 “attributes” that admission uses to identify exceptional traits. Some of these are easily quantified, such as being the child or grand-child of an alumnus, a member of a minority group, an “impact” athlete or a local resident. Other more subjective “tags” draw attention (usually but not always favorably) to something special about a candidate, like a powerful passion or aptitude for scientific research or an interest in getting a non-science Ph.D.
We are able to admit roughly 120 top rated musicians each year from the top of the academic reader rating scale–what we refer to as academic 1′ and 2’s (broadly defined as 1500+ SAT’s and very top of the class). In other words, for many/most attributes, the College does not need to dip below AR 1s and 2s. Yes, being a top musician may help you in the competition with other outstanding students, but, if you are AR 3 or below, it won’t. You will be rejected. And the same applies to other attributes. Top students are also, often, deeply involved in social service or theater. In high school, they often excel in research science or political activism. If Williams were to admit only AR 1s/2s, it would have plenty of students in all these categories. Third, for applicants with AR 3 or below, the attributes that matter most are race, income and athletics. Does this mean that no other attributes ever matter? No! It is certainly the case that the daughter of a prominent alum could get into Williams as an AR 4 or the son of a Williams professor as an AR 3. But the major categories, the ones that account for the vast majority of AR 3 and below admissions are race, income and athletics. 1) There are 100 or so admissions decisions which are driven by a Williams coach. You are either on her list or you are not. These “tips” and “protects” are, by definition, only used for students with AR 3 and below. Best single post overview of the topic is here. Asian-Americans in the 700+ range are at least 6 times more common than African-Americans/Hispanics. So, how can Williams have more African-Americans/Hispanics than Asian-Americans enrolled? (Hint: It isn’t because there aren’t 100+ Asian-Americans among the AR 1/2 applicants who are currently rejected by Williams.) The reason is that Williams admits scores of African-American/Hispanic applicants with AR 3 and below. Williams does this because it wants a class which “mirrors” or “reflects” the US population, at least when it comes to African-Americans and Hispanics. 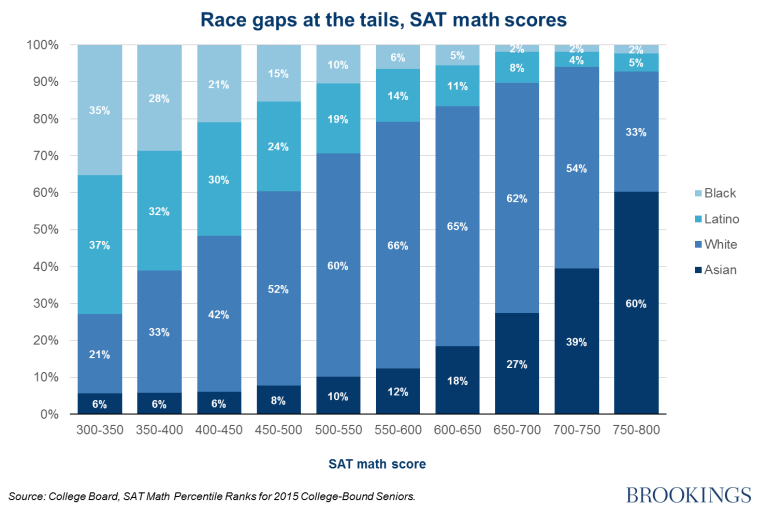 Note that the average African-American student at Amherst has an SAT score consistent with AR 5. It is highly unlikely that Williams does a better job than Amherst at attracting highly rated African-American students. 3) Unlike athletics (which the college is, sometimes, transparent about) and race (on which there is good data), family income and parental education are trickier. The College reports (and is proud of the fact) that about 20% of students are eligible for Pell Grants and that about 20% of students are first generation college students, meaning that they come from families in which neither parent has a 4 year BA. (Of course, there is a big overlap between these two groups, and, to a lesser extent, between these two groups and African-American/Hispanic students.) The problem is that all standardized test results (and, therefore, academic rating) are skewed against such students. So, in order to get to 20%, Williams must admit scores of such students with AR 3 or below. About 1/2 of a Williams class is AR 1 or 2. (The median math+verbal SAT score at Williams is 1450, which is the bottom of AR 2.) There are 100 recruited athletes (all of whom, by definition, are AR 3 or below), 100+ African-American/Hispanic students, 100+ first generation and 100+ Pell Grant recipients. That adds up to 400+ in a class of 550! Many students fall into more than one category. Many (outside the athletes) are AR 1 or 2. But, given that we only have 275 spots left beneath AR 1/2, a large majority of the bottom half of the class are members of at least one of these 4 categories. The bottom 100 students in each class (approximately AR 5 and below) is almost completely dominated by these students. And, in the categories outside of athletes, academic rating drives the decisions. Williams is much more likely to accept an African-American and/or a first generation student and/or a future Pell Grant recipient if her academic rating is 1 to 3. Every single AR 9 applicant is rejected, regardless of her other outstanding attributes. And that is how admissions works at Williams, and almost all other elite colleges. Has Falk sent an email about Las Vegas yet? Does he have no sympathy for any of the victims? Nothing to say about gun control? Athletes are by definition AR3? Utterly absurd. If they are black or transgender perhaps, so the college can check an extra box but otherwise the same mix of scores as anyone else. The school could offer admissions to nothing but AR1s but guess what happens numbnuts? A higher percentage of those kids are going to go to Harvard, Princeton, etc. The fact is, for many of those kids Williams is a backup and the school has to accept a mix of students that it thinks will accept to maintain the always important yield percentage for USNews. Of course, that’s the real reason colleges use early decision, so they can blend 100% yield with 35% yield from regular admissions. I believe he was saying “by definition” with respect to athletic *recruits*, not athletes in general. Coaches wouldn’t need to burn one of their recruit slots on an AR1 or AR2, who could get in through the front door, but AR3 or below would have to be a recruit to be admitted. I forget how this works, but suppose there is a tennis player who is an AR 1 that the coach would like to have on the team. Is coach required to use a tip or protect to ensure admission for that student? Or can the coach get this person admitted without using up one of the slots allocated to the tennis team? Or can the coach “protect” as many AR 1 (and AR 2?) applicants as he or she wants? I made this same argument. Over half the students admitted will not choose Williams, while over 80% of the students admitted will choose Harvard. There are all kinds of stipulations attached to this, of course. In a previous post a commenter pointed to financial aid as a part of this equation- but isn’t what you offer in aid part of the competitive nature of college admissions? You are competing with places that offer aid to those in need- and Williams is supposed to be need blind. I made the point that I believe over half the kids that apply to Williams are using it as a safety. That is an overstatement- but perhaps not much of one when you consider the low yield of 40- 45%. Remember, not everyone who uses ti as a safety will get in. For David’s hypothesis to be valid, the AR1’s who are not admitted but that the college would admit in lieu of “the lower ARs for athletics and diversity” would actually have to choose Williams to increase the scores as David suggests. There is no indication that they would- in fact, the average board scores and 45% yield suggest many would not. The first fantasy of Kane’s argument is that Williams is actually competing with HYP… which is a joke on its face. It’s not. HYP admit less than 10% of the applicants, have much higher SAT scores, and much higher yields. It’s not even close. Williams is probably competing with Dartmouth and Cornell… Dartmouth in particular because the flavor is the same (small, rural)- although it is still harder to get into Dartmouth than Williams. I forget how this works, but suppose there is a tennis player who is an AR 1 that the coach would like to have on the team. I believe that AR 1 and 2 admits are “free” for the coach. They are additional to the allotted tips and protects. EphBlog is powered by WordPress and delivered to you in 1.224 seconds using 37 queries..